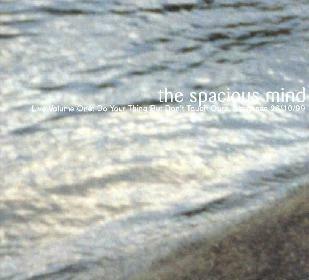 The Spacious Mind - "Live Volume One: Do Your Thing But Don't Touch Ours"
This is a brilliant live CD recorded in Skogsnäs at a hippie kommune in the north of Sweden in 1999. I had the pleasure of hearing this concert not long after it was recorded and I was quite blown away. It was recorded directly to CD-r with two microphones but really captures the live ambience and special feel the band had on this night. This was about a year after the incredible Garden Of A Well Fed Head LP was released. The band begins with a very spaced out version of "Upon Which Areas May The Circles Be Drawn", from the Garden LP. This is extended from the LP to about 23 minutes and flows into a nice jam. The whole performance has quite an improvised feeling but it totally flows. "The One That Really Won The War" from the Organic Mind Solution CD is next. This sort of flows into "Interplanetarian Lovemachine Part III". The CD closes with the brilliant "Euphoria Euphoria!" If you are a fan of late 60's instrumental Pink Floyd, you can not get better that this. One of the top psychedelic space rock bands in the world. A must own CD. When can we get Volume 2, 3 and 4???? For more information you can email Goddamn I'm A Countryman Records at: countrymanrecords@hotmail.com.